Walking in Mwaiseni is overwhelming. It’s hot and dusty. Techno music blares from the bars on every corner. It’s a weekday morning, and everywhere I turn I see people staggering around, drunk. And children are everywhere. We visit them in their homes and hear a common theme; dad left long ago or suffers from alcoholism and mom spends her time in the nearby village looking for work. If she gets lucky and finds work, usually cleaning or washing, she might come home with enough corn meal for one meal. Children fend for themselves, day after day. Seemingly simple tasks are more complicated than we imagined. We fetch water for 9-year-old Elizabeth, caring for three younger sisters, only to find an intimidating fee collector at the neighborhood water tap with complicated requirements about the size of your water jugs and how much each will cost. It might only cost 10 cents for a bucket of water, but Elizabeth certainly can’t spare 10 cents. Nearby, eleven-year-old Michael is deaf and mute. His grandmother looks after him, and together they spend much of their time tending a garden that provides a bit of food and little income. I can’t help but consider, if Michael lived where I live in one of the poorest neighborhoods in Minneapolis, he would be getting two nutritious meals a day at school as well as an individual education plan and support from an aid, a social worker, and a speech therapist. And yet, walking in the streets of Mwaiseni with Esther, I get a hint of some of the demands of what she’s taken on. Everyone seems to know her. Some women call on her to look at their babies’ ailments. Others mock her under their breath. She carries the burdens of an entire village on her shoulders. I am broken by what I see and hear and smell, and yet hope fills my heart as I walk alongside Esther, a woman living by faith rather than by sight. I promise Esther I will return to walk with her in Mwaiseni again, and I will bring others who are willing to share her burden. In the meantime, I pray and tell Esther’s story. I seek out the vulnerable in my own community and practice loving them. I am so thankful to God for breaking my heart for His people, and I pray that He will use me in some small way to encourage Esther so that she can continue to walk those hot, dusty roads and bring hope. Brooke Heubner is a former Hands at Work volunteer living in Minneapolis with her husband Jed and two foster children, 6- and 8-year-old sisters. 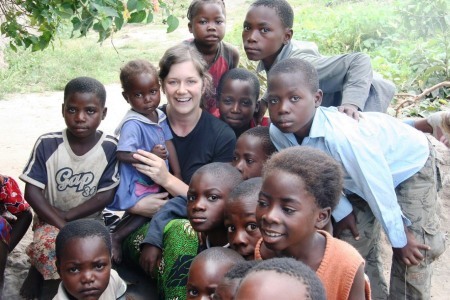 In May she took 3 weeks off from her job as a biostatistician to return to Africa for Hands’ annual Celebrations. Her friends and family partner with Hands at Work to support 32 children in Mwaiseni, Zambia, enabling Esther and the team of care workers there to provide parental home visits, school support, and one nutritious meal per day starting on July 1. Newer PostGeorge Snyman is Coming!